Chiva Som was recently voted the number one spa in the world by Conde Naste and it easy to see why. Internationally acclaimed health resort Chiva-Som in Thailand continues to pioneer wellness travel with the launch of five new retreats designed to address specific health issues. With wellness and longevity at their core, the programmes support treatment of specific conditions including cancer (Cell Vitality), migraines (Cranial Relief) and high blood pressure (Tension Release), as well as assisting in the management of stress (Emotional Wellbeing) and excess body weight (Sustainable Slimming) – all of which can often be managed through diet and lifestyle interventions. This retreat has been carefully created to support guests who have recovered or are in remission from cancer, with the programme fine-tuned by wellness experts for each individual guest. A selection of nurturing and non-invasive treatments is accompanied by a gentle exercise programme to promote physical and mental wellness and sustain cellular health; and a dedicated dietary plan designed to stimulate the appetite. A dedicated retreat for guests who suffer from migraines and life-disrupting headaches. The programme combines holistic and physiotherapy treatments, including meditation to promote balance and stability, specific exercises that promote cranio-facial muscle relaxation; and a dietary plan of fresh, organic and nutrient-rich foods. Created for guests who feel over-stressed or lack energy, this retreat is designed to rejuvenate the mind, body and spirit. A holistic approach includes acupuncture, mind and body therapy and functional exercise classes; these are combined with coaching in healthy eating, regular fitness and a stable sleeping pattern to equip guests with the tools to control stress, mood and overall wellbeing. Unlocking the ability to escape tension-causing routines is key to discovering true inner peace. This retreat is carefully designed to help guests who suffer from high blood pressure regain a restorative balance in life. Through nutritional consultation, they will discover simple steps to controlling salt intake, maintaining a healthy weight and the appropriate use of dietary supplements that can help support cardiovascular health. Personalised fitness activities can enhance energy and reduce weakness and fatigue, providing a clear path towards long term tension release. Chiva Som boasts an impressive list of celebrity clients including Kate Moss, Naomi Campbell, Hugh Grant, Jude Law and Woody Harelson to name but a few. Land of Smiles but I was keen to investigate what it has to offer families. 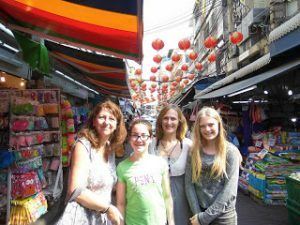 So I set off with my lifelong friend Catherine, her daughter Alice and my daughter Nicole, to see what Thailand can offer us girls. The first thing we find is that if you don’t go looking for the unsavoury side of Thai life, you won’t find it. Our holiday starts on Phuket, Thailand’s largest island. 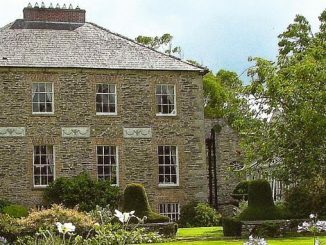 Serviced by an international airport, it can be reached from Dublin with just one stopover. A transfer by taxi takes one hour to The Cape Panwa Hotel and Spa, where the lobby has no doors or walls but instead wonderful woven fish hanging from the ceiling. A blanket of warm air envelops us as the receptionist distributes cold hand towels and a refreshing juice to drink. Thailand has two seasons, hot and hotter, an almost perfect climate. Overlooking the private beach and tropical palm trees, our huge rooms are a hit with our daughters who can’t wait to try the Jacuzzi bath on the veranda. First port of call when travelling with the girls is to the infinity pool down by the hotel’s private beach. 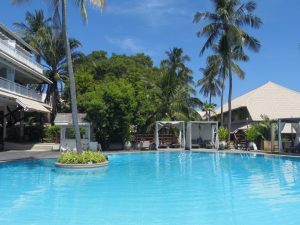 The hotel’s other pool boasts cabanas and comfortable padded loungers for sunbathers. That night we eat in one of the hotel restaurants and although it is five star service the prices certainly are not. The bill comes to €30 for four people. Thai food is spectacular and you can eat very well for less than €5 per day if you chose to dine at one of the many street stalls, a bonus when feeding a hungry teen and tween. The next day we are met at 11.30am by a bus that takes us to the north of the island and the John Gray Sea Kayak Excursion. The Hong by Starlight Tour starts in the afternoon and we bring a change of clothes on instruction. 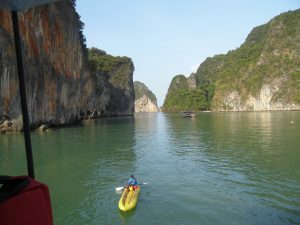 We are taken by traditional Thai boat to explore the caves of the Ko Hongs. Brought to the world by James Bond, on the big screen, these tiny islands sprout out of the crystal blue waters of Phang nga Bay and hold a host of treasures within. But first we get into the sea kayaks with our guide, Upsy, who is appointed to us for the duration of the day. 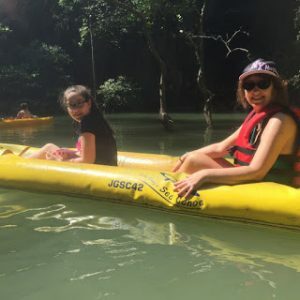 Upsy paddles our canoe through caves covered in stalagmites and home to hundreds of fruit bats. This adventure is not for the claustrophobic because it is a tight squeeze through the caves to get to the centre of the Hong. But the journey takes us out the other side to an oasis of calm and tranquillity among the mangroves. This fragile eco system has been in existence for thousands of years and the girls excitedly lookout for monkeys while they wade through the waters inspecting the fish and wildlife. It’s dinner time and the colourful food on offer in the buffet is as delicious as it looks − the girls especially love the healthy rice dishes. 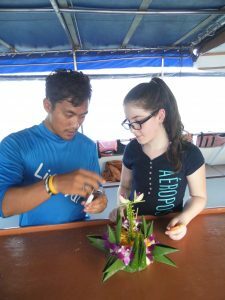 After a swim Upsy shows us how to make a kratong (a floral offering made from banana leaves and Singapore orchids). As darkness descends we take our final excursion through the hongs, we light the incense and candles of our kratong and make a wish as we send the Buddhist offering out to sea. Thousands of tiny lights from bioluminescent plankton light up the caves, like tiny fireflies in the water. When we reach the centre of the Hong, the monkeys appear, swinging through the mangrove trees. 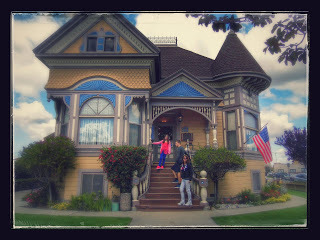 It’s a transcendental experience from start to finish and one that we will never forget sharing with our daughters. We spend next day exploring the massage and beauty salons that line the steep road to our hotel and choose one with comfortable air-conditioning and WIFI. Girly heaven costs a little over twelve Euros for a coconut oil massage that lasts well over an hour. I’m careful to ask for a gentle massage because these ladies have extra strong fingers. A pedicure is only €10 and a manicure even less and as there aren’t the usual stipulations for the girls to be over 16 our daughters get the full benefit of our spa day. Catherine is completely hooked and sneaks off for another quick massage after dinner. Cape Panwa is the perfect resort for families with great choice of restaurants and stalls selling trinkets along the beach front but Thailand is a big country and we have another island to explore. 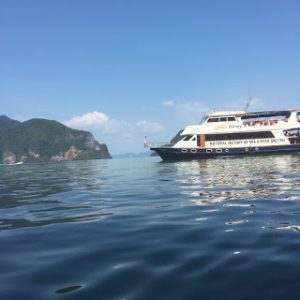 So, next day we take a speedboat to Koh Yao Noi in Phang nga Bay. We share our speedboat transfer with a Danish family who tell us this is their second time going to the same resort. Scandinavian, French and Germans families seem to have earmarked the most desirable unspoilt islands to visit and it makes me wonder why the Irish haven’t also done so. As we step off the speed boat we are greeted by a sign welcoming us to ‘Paradise’. “I wonder how much is a massage?” Catherine asks. A massage on the beach is €12 so that will do her nicely. Built into the mountainside, the rooms are best described as luxurious eco dwellings, a plunge pool Jacuzzi beckons from the deck against the backdrop of turquoise waters and palm trees. We get to eat our dinner that night with sand tickling our toes at the beachfront restaurant. 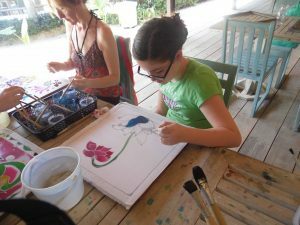 Batik painting is our first call after breakfast and for only €2.50 each our patient teacher helps us to make a silk masterpiece that we can bring home as a memento. 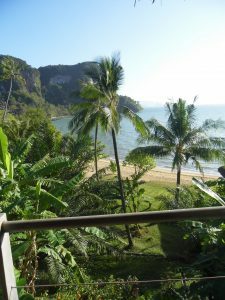 Only 8km long, Koh Yao Noi is easily explored in half a day and we hire a taxi for less than €40. To get to the other side of the mountain we first have to cross dense forest and the girls are agog at the tiny pots of white goo hanging from the rubber trees. Our driver stops and lets us see the process and touch the latex in its natural state. The main village is surrounded by rice fields and cows while the fishermen’s houses are built on stilts at the water’s edge to accommodate the rising tide. Our daughters, being part of the selfie generation, are snap-happy with so many photo opportunities in this exotic and different land. When we return to our hotel we decide to make use of our complimentary Yoga class, on offer to all hotel guests, and we ask instructor Kaylin if the girls can come too. We are told providing they can concentrate they will be fine. Catherine and I struggle with some positions, while our daughters stretch across their mats like a couple of elastic bands. As I fumble with the belts and blocks, Catherine and I get a fit of the giggles − our daughters aren’t the ones to disturb the class after all. But in this perfect setting with the waves lapping in the background Kaylin is very cool and relaxed and helps me focus on my poses. At night we are entertained on the beach by some traditional dancers and a Thai Boxing routine and we really don’t want to leave this paradise. 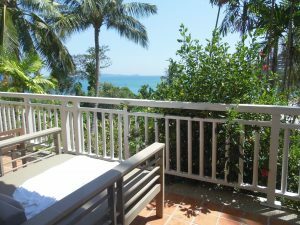 Next morning, we take a short one hour flight from Phuket to Bangkok and check-in at the Cape House, a sister of our hotel in Cape Panwa. The two-bed apartment is perfect for families and the rooftop pool sets us far from the madness of Bangkok’s busy streets. We have a reservation for a very special dinner on the Loy Nava Cruiser on the Chao Phraya River. The Loy Nava was tastefully converted from an antique rice boat into a river cruiser in 1970 and we are greeted on boarding with garlands of flowers for good luck. Traditional musicians and dancers entertain while dishes of exquisite seafood are brought out at regular intervals. Cocktails for the mums and mocktails for the girls, with the lights of Bangkok and the warm breeze providing natural air-con, we are brought to a different dimension. The same shuttle bus that collected us takes us back to our hotel and a good night’s sleep because we have a busy day ahead. Bangkok like any other capital city has its must see sites and The Grand Palace, home to the Royal Family, is one of them. Unlike its south-east neighbours, Thailand was never colonised by the British or French hence the name Free Land, Thai meaning free. 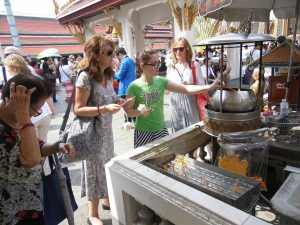 We get to see the Emerald Buddha and partake in the Buddhist ceremony of offering candles, incense and flowers. The kids love the adorned temples and unusual architecture quite unlike anything they have seen before. 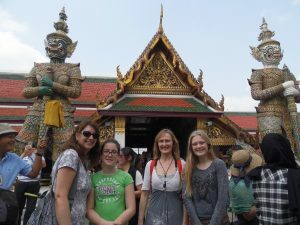 The Wat Pho Temple, home to the largest reclining Buddha in Thailand, is close by so we pay a visit before heading off on an adventure through the cities Khlongs (canals) on a long tail boat. As we speed up the Chao Phraya we get to feel like James Bond Girls. Our guide pulls over to the side of the river where an old woman sells bread, he gets the girls to throw it into the water as hundreds of huge carp jump up to eat it, much to the girls squeals of delight. We don’t have time to see the floating markets but we have to leave something for next time. 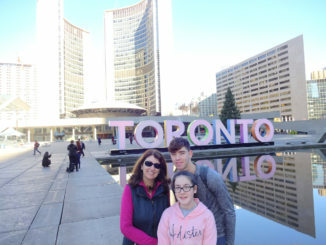 We finish the day shopping in Chinatown but the department store MBK is the must do for shopaholics, we pick up bargains, especially in shoes and dread the thought of going home. Thailand shouldn’t just be a bucket list destination, for a higher outlay on flights a family can make up the difference with top class hotels and food and make massive savings on pedicures and massages! Prices are based on 2 sharing travelling between 1st February – 31st March 2017, 3 nights BB in the 4* Rembrandt Hotel Bangkok and 6 nights at 4* Centara Karon Resort Phuket and 2 nights Full Board at Elephant Hills Jungle Safari. Flights are with British Airways from Cork or Dublin. Offer subject to availability at time of booking and maybe withdrawn at any time. 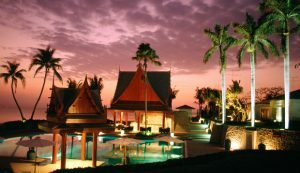 Prices are based on 2 sharing travelling between 1st May – 25th June * 20th August – 31st October, 3 nights BB in a 4* Rembrandt Hotel Bangkok and 7 nights at 4* Centara Seaview Khao Lak on BB. Flights are with British Airways from Dublin. Offer subject to availability at time of booking and maybe withdrawn at any time. Prices are based on 2 sharing travelling between 1st May – 25th June * 20th August – 31st October, 3 nights BB in a 4* Rembrandt Hotel Bangkok and 7 nights at 3* Chaba Samui Resort in Chaweng Beach BB. Flights are with British Airways from Dublin. Offer subject to availability at time of booking and maybe withdrawn at any time. For anyone nervous about travelling to Thailand it is worth noting that it is on much lower grade terror alert than France or Turkey yet we still travel to our neighbouring countries. I spoke to the award wining travel journalist Eoghan Corry to see what he has to say about the recent spate of terrorist attacks safety and he assured me that most incidents are isolated in Thailand and very much in the southern border of the country. The recent spate in Bangkok are not necessarily ongoing nor are Irish persons likely to be caught up in them. He said that there have been five Irish citizens killed world-wide over the last twenty years and he then named them. The travel industry is taking a terrible hammering in the same way as Ireland did during the troubles in the 70’s and 80’s -In the same way it was not advisable to walk down the Shankill in those days, the troubles kept visitors away from the lakes of Killarney and other beauty spots where there was no risk of terror. Where are you going for Valentine’s Day?